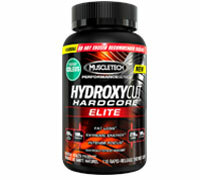 All-new HYDROXYCUT HARDCOREÂ® ELITE was rebuilt from the ground up with one purpose in mind: to provide you with an amazing sensory experience. With potent amounts of Coleus forskohlii, L-theanine, theobromine, and caffeine, this powerful formula delivers a one-of-a-kind sensory experience and jacks up energy levels! HYDROXYCUT HARDCOREÂ® ELITE also contains a powerful ingredient (caffeine) to help deliver a serious boost of energy and endurance! If you demand what’s best for your body and want an intense formula that works as hard as you do, look no further than HYDROXYCUT HARDCOREÂ® ELITE! 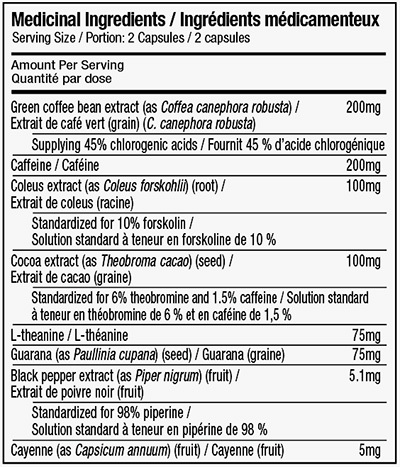 NON-MEDICINAL INGREDIENTS: GELATIN CAPSULE (GELATIN, TITANIUM DIOXIDE, ALLURA RED AC, BRILLIANT BLUE FCF), MICROCRYSTALLINE CELLULOSE, MAGNESIUM STEARATE, SILICON DIOXIDE. / INGRÃ‰DIENTS NON-MÃ‰DICAMENTEUX : CAPSULE DE GÃ‰LATINE (GÃ‰LATINE, DIOXYNE DE TITANE, ROUGE ALLURA AC, BLEU BRILLANT F.C.F. ), CELLULOSE MICROCRISTALLINE, STÃ‰ARATE DE MAGNÃ‰SIUM, DIOXYDE DE SILICIUM.